Every summer Wednesday afternoon, sit back with a glass of iced coffee and enjoy peeking into the world of a homeschooler, and her observations of her past year. This Wednesday, an interview of a day in the life of Krina. Krina is a mama of four kids – aged 14, 13, 11, and 10. She’s 10 years into the home educating business. What have you learned about your kids’ learning styles this past year? My eldest two both participated in a class through a homeschool community group that focused on Social Studies skills. There were a number of large projects they were required to do which were outlined at the beginning of each term. Term two they had to complete posters about a South American Country – the night before the project was due only one of the two had done work prior; the other was ashen and stressed. I felt very bad for her but it also served as a great opportunity to talk about planning and organizing of time. I also noticed how closely she adhered to the outline she was given – she added nothing more and left nothing out. She likes her guidelines. Regardless, she fared better the third term, leaving only a smidge of work until the last minute. What have you learned about yourself this last homeschool year? A little outside stress (like teaching in a homeschool Community group) actually makes me a better at home learner mum. I tend to “go big, or go home” as regards to teaching in groups (might have something to do with my unrequited love of teaching the masses – see previous degree in Education) and in doing so I began to realize how I had let myself grow complacent at home with my own kids. It is easy for me to take for granted that we are home together all the time and use that as an excuse not to “join” in with them as often. Seems like a backward thought, but by offering my services elsewhere, I am more inclined to invest more at home. What is a favourite new book or curriculum you’ve used with your kids? My favourite go-to curriculum at present is anything which can be made into an Interactive Notebook – I usually find packages through Teachers Pay Teachers and augment with other learning I dream up at home. The kids and I completed a poetry unit together this way and although it is a lot of paper and glue and cutting – yes, I made my 14 year old cut and paste – I like them because they provide a structure from which I can leap – as a more sporadic learner who jumps around in thinking I need something flexible but which still provides guidance. No scripts for me – but a broad strokes framework does wonders. My kids appreciated finishing a project. What do you do for you — or do outside of your kids that is just you? What do you fight about with your kids? And how have you learned to handle it? The most persistently annoying thing that comes up between the kids and I – would have to be cleaning up. It is a trigger for me – and I admit that is because I have not enforced the habit. Guilt infused with annoyance makes for a grumpy face and attitude. I have finally put together clear instructions for house chores, daily expectations, and a way to track the completion of those jobs so that we are all clear about how and when and what needs doing. What do you do every day that helps you be the best homeschool mom you can be? I don’t know if there is something I do every day – this summer I am working to establish more of a personal routine regarding my own explorations and learning so hopefully I will soon have an answer to this question. Things you’ve learned about your daily routine this year that you’re going to change for next year. Ten years into this homeschooling thing and I have just discovered that what they told me in university about outlining expectations clearly…actually works. This summer (yes, just this summer) I learned that giving my kids a clear checklist of daily activities results in more learning, more cleaning, happier kids, and a happier me. It is as if a load lifted off my shoulders – and the sun shone on my face. Now the trick to the whole thing is …reward. When the items on the list are completed (to my satisfaction) they are free to have screens regardless of the time of day. Yes, we are a wired up, tech rich house (thanks to a Dad who is in the tech industry and loves gaming). 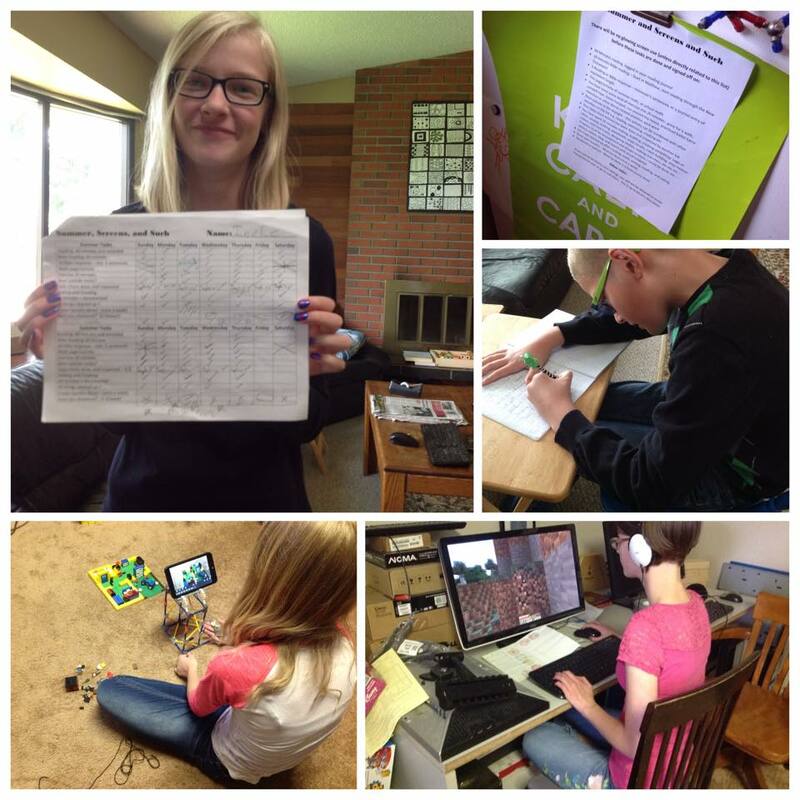 So they have gadgets galore – and although I don’t love hours spent watching Minecraft videos, they do — and are quickly learning that hours spent watching Minecraft videos can get boring, and together we are finding balance. I even made a list for myself – and although I don’t have a carrot slung out in front of me – I am working on my future self – the one who is not just a homeschooling mum. Tags: day in the life of a homeschooler. Bookmark the permalink. Lovely! Thanks for this glimpse of Krina.